Gonsalvo DeZilva comes from the lands of Further Navarre, located along the Western Coasts. Further Navarre was once a powerful Merchant Kingdom until it fell into decline and became the westernmost province of Imperial Accadios. After the death of his mother, young Gonsalvo was sent to the Cathedral in Cadorés by his father, the Hildago of a lonely village in the foothills of the coastal Manzanares mountain range. The Priests trained Gonsalvo to be a Holy Warrior and hoped that he might lead his village and assume the role of Hildago one day. But when Gonsalvo finally returned home he found the family estate desolate and abandoned, and the vineyards untended and dead. In the sleepy nearby fishing village Gonsalvo learned that his father, the old Hildago, had gone off and disappeared into the ocean wastes, lured away by demonic sirens and their songs of treasure, adventure and lust in lands beyond the sea. Gonsalvo returned to Cadorés and joined the Order of Light, dedicating himself to vanquish the evil that has poisoned the western kingdoms. Journeying east from Accadios, he has arrived at a lonely keep that borders the Great Eastern Wastes, following whispers of a powerful and ancient evil that sleeps beneath the sands of the Ruined Kingdoms. Leading the main party in the Eastern Wastes. Laying on hands, burying the dead. Written and role-played by Nick Cole. Barabosa runs a gleaming blade across his pectorals, placing a massive hand over the gushing torrent of blood. With the main party in the Eastern Wastes. Making a bloody mess. Written and role-played by Jason Anspach. Thorson Hammerfist hails from the Stone Kingdom of King Odric and the Grey Dwarves. His older brother Garkist joined the Longbeards, Odric’s elite personal guard, and Thorson’s lot as a second son saw him cloistered in the retreat known as Moradin’s Mountain. At the age of twelve, he became an acolyte there and only recently entered formal service as a cleric of Moradin. Thorson proudly wears the headband of Moradin, the oldest of the Dwarven gods and patron deity of Creation, Earth, Good, Law, and Protection. Several weeks ago, he left the Mountain, ready to spread the hand of measured justice across Odric’s kingdom. But as he neared his home, as the familiar, rocky face of the Stone Kingdom rose to welcome its returning son, the earth beneath Thorson’s feet began to shake violently. Great fissures opened in the road, ancient trees became uprooted and snapped like matchsticks, and animals fled for their lives from the surrounding forest—these chaotic flashes of memory are the only thing Thorson can recall of the event. When the Great Upheaval subsided, the Stone Kingdom lay in ruin, thousands dead, including King Odric. From harried survivors, Thorson learned of rumors from the east that had not reached his ears in the faraway monastery—rumors of an Ancient Evil awakening. With Moradin’s call to witness for justice burning within him, Thorson takes up the quest to seek an accounting for the suffering of his people—and to protect others from the evil rising in the east. He’s made his way to a lonely keep, the last symbol of civilization, a gateway to the Great Eastern Wastes. With the main party in the Eastern Wastes. Healing wounds and getting all delusional about his chances with the she-elf. Written and role-played by Chris Pourteau. Traveling merchants from as far away as Hub, the border town that connects the east and west via the Tradesman’s Road, bring rumors from the east. Tales of seemingly apocalyptic events reach the cautious ears of King Fuinor of the Wood Elven realm of Silverglen. Tales of natural catastrophes occurring in unnatural magnitude and frequency. A Great Upheaval that destroys the Dwarves’ Stone Kingdom. Children stolen in the night from Hub and other settlements along the border between east and west. Demonic voices leading men to their doom. Though King Fuinor is content to sit high in the trees of Silverglen and let the rest of the world suffer itself to ruin, he also knows he must be ready for whatever is coming. Refusing to send his personal guard on such a dangerous mission, he summons Mirima Nasir to his court. 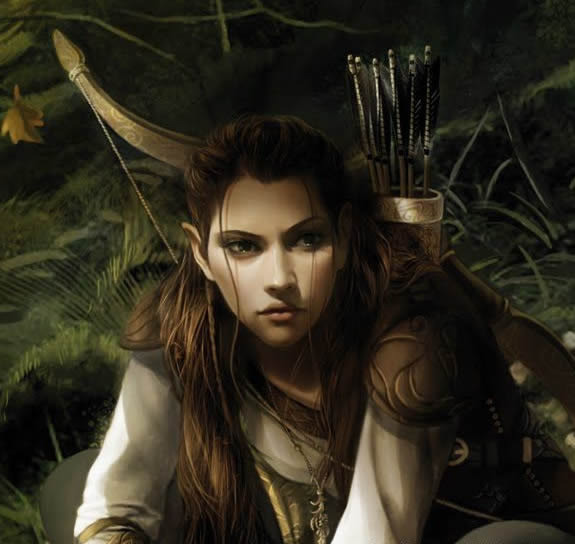 He holds little love for the talented but rebellious ranger who prefers spending her time caring for the animals of the Glen rather than socialize with her Elven kin. The task suits Mirima, a loner, whose curiosity often lands her before Fuinor to be reprimanded for one transgression or another. Under orders from her king, Mirima strikes out for the east and has only recently arrived at a lonely keep on the outskirts of the Great Eastern Wastes. With the main party in the Eastern Wastes. Looking for missing appendages, and threatening general castration. Farson Windhoek was born an orphan and raised by a “college” of traveling bards known as The Forty Upon Fifty. Unjustly accused of being a band of thieves as well, The Forty Upon Fifty were wiped out in the westernmost province of Imperial Accadios by a lynch mob of peasants and clerics five years ago, leaving Farson Windhoek one of the few survivors from the massacre. A man haunted by the past, he wanders out to the desolate East, covering up his bitterness and resentment with jokes, music and long drinking sessions. He’s looking for enough gold and treasure to start a life of leisure and luxury, and to forget the horrors of that fateful night in the West…And he will do anything to obtain them. Meldryn Thunderbeard traveled the realm as apprentice to Tegid Tathal, Chief Bard of the Nine Kingdoms. Tegid took Meldryn as his sole apprentice when the young dwarf was only six years old. It is almost unheard of for a dwarf to show interest, let alone skill at the finer arts of enchanting and musical conjuring, yet Tegid had a vision of the young dwarf while visiting the dwarf village. Tegid took the youngster and vowed to teach him all he knew of the physical world and how it can be bent to the will of the servants of the Swift Sure Hand. Meldryn finished his training and set out on his own, travelling the realm where he began hearing news of trouble in his home land, and the death of the beloved King Odric. Meldryn returned to the land of his birth to see his family and neighbors killed and the kingdom destroyed. Meldryn made a vow to the Swift Sure Hand that he would see justice served and the dark forces responsible destroyed. With the main party in the Eastern Wastes. Looking to get rich or die trying. Getting really close to the latter. Left behind at Dol Harak by the main party. Looking for his pants, and his big break, at the city’s seediest inn. Anjou Jen was born into a peasant family in the mountains, working the local lord’s lands for a meager subsistence. Anjou worked competently as he was told, but his eyes never strayed from the horizon and his mind never stopped wondering what else was in the world. At the age of 9 he left his village and traveled until he came to the Sankin Kotai monastery, which he had heard of but never seen. For three days he stood before the great oaken doors, waiting. After the third day, the doors opened and a wizened man in red robes bade him enter. Over the next decade, Anjou was taught to defend himself and to attack; the ways of mustering and channeling his *ki* into physical acts, and learned letters, handwriting, and reading. Now, his Master has ordered him away from his home and out into the world, to learn about the rigors of life. Brother Anjou has no idea what lies ahead but will not refuse his trial. With the main party in the Eastern Wastes. Having all of his discipline and self-control tested by the the bard. Written and role-played by Jon Frater. Rook Manning hails from the village of Sheybrook where he grew up on a farm with his human mother and elven father. Life was good for a time but his father was never accepted by the people of the Headon and he died under suspicious circumstances. Rook’s mother was left destitute and turned to a life of whoredom. Rook spent much of his childhood thieving and fighting for his life. He has a terrible scar on his face that he received as punishment for stealing in the city of Headon, a scar that has essentially made him an outsider wherever he goes. Rook has been traveling from town to town, working as a hired sword when he can and stealing whenever he has to. This is what lead him to Wygate, where he accidentally killed a man in a tavern. Considered an outlaw all across the land, Rook has fled to the edge of the known world, the lonely keep on the border of the Great Eastern Wastes. Written and role-played by Kevin G. Summers. Dol Harak’s resident madam and Queen B. An exotic seductress, she is the current employer of the main party. Synsila has been looking for a way to rescue her father, Fay’zuz, from his Drow captives since his abduction. A once powerful seer and Synsila’s father, the last of her kin. Stolen from Synsila when she was a child, Fay’zuz was blinded by the Drow. He is one of the thirteen siphoned to serve as an arcane power cell for the wandering city. A mysterious Drow Slaver who claims to be aligned with Synsila. Half-Ogre barkeep of Wayroad Inn. Now the owner of a pile of ash. Whispered about in the darkest shadows, the Veiled Blade is a network of assassins, feared throughout Forsaken Ruyn. Black-skinned Elven abominations who were forced to flee the Western Kingdoms during the War of Gates. The Drow seek refuge among the harsh dunes of the Great Desert. Living as nomadic tribes, they are loyal to Ancient Saur. An ancient reptilian race born of pure evil, The Saur are Necromantic overlords of a once vast empire of death and decay. They are revered as gods by the Drow. A mysterious faction of fanatical Drow. They are servants of the Black Dragon. Each member is tattooed with dual infinite serpents. A dusty intersection marked by a lone obelisk. 100 years ago, the IV Accadion Legion, an elite army of battle-hardened warriors, were tasked with eradicating the rising evil to the East. Crossroads was the last place the Legion was seen as they marched to their doom under the falling rays of the setting Sun, deep into the unknown of the Great Eastern Desert. The last stronghold of civilized life in a barren corner Forsaken Ruyn, you will never find a more wretched hive of scum and villainy. A bustling hub of cultural diversity known all across Forsaken Ruyn as the Red Keep. Scents of seared, spiced meats fill the dry air. Merchants line the streets, dogs growl and snap at each other, fighting over the fallen morsels knocked from vendor stalls as citizens in multi-colored robes hustle back-and-forth to wherever their day’s deeds beckon them. Armed guards patrol the dusty paths between buildings. Hushed deals and silent trades happening under their watch as coins fall into their eagerly open hands. The site of an unsuccessful ambush upon Chezzek the Vile, a Saur warlord with an insatiable taste for genocide and reanimation. An impenetrable, colossal mesa of mile high rock. Slender waterfalls rain off its peaks to tease a sparse palm forest below that offers little shelter from the Outer Waste’s harsh climate. The mountain range runs the span of the continent from the Northern reaches down to the Southern Sea, breaking once in the south. Those who have lived to survive the treacherous climb to the brink of God Bridge speak tales that upon its level, widespread tops sit vast lakes, where water has collected in the celestial footprints of Jantalar and Modron, who waged war against each other for a thousand years. The war is said to have spawned from their jealousy over a mortal love neither would ever have. The stretch of desolate land between God Bridge and the endless desert to the East. A No man’s land and home to the dual towers, the broken sentinels of Dol Harak and Dol Haran. A mythological ruin and the capital of Ancient Saur, a city of death and plague deep in the Great Desert. None have seen the white pillars in centuries. They are thought to be hidden by the relentless moving sands, seeking to forget the horrific crimes of the Saur, buried far below. Desert, dying flora, and rocks jutting from the sandy earth are all that lay to the east. Without suitable preparation, death is all that awaits those who venture the endless dunes. Rumors of nomadic Drow, ancient slaves to the Saur, tribes of killers waiting in ambush, below the sands are whispered into terrified ears. Nightmares to scare children, or is there truth to the claims? A nomadic Drow city built upon the backs of colossal scorpions and powered by the Thirteen; humanoid slaves, siphoned of their arcane energies to keep the mystical city mobile. Yeksi is the hub of all Drow tribes residing in the desert. Once the last haven on the worn path north to the Red Keep, the Inn was reduced to a pile of ash by an underground attack by mining duergar. The half-ogre Grunk owns the establishment…er, ashes.